Spirit Aerosystems is investing $1 billion in its Wichita facility, creating 1,000 new jobs. Wichita's largest private employer is about to get larger. If the region's aerospace cluster were a shopping mall, Spirit AeroSystems would be one of the anchors — a magnet operation that attracts customers, suppliers and talent on a scale of its own. Textron Aviation (Cessna and Hawker Beechcraft) would be the other anchors, and dozens of other aerospace companies populate the area, including Airbus's engineering complex. Spirit employs more than 10,000 in Wichita, where the maker of aerostructures — fuselages, pylons, nacelles and wing components — is investing $1 billion over the next five years, creating 1,000 new jobs during the next two. 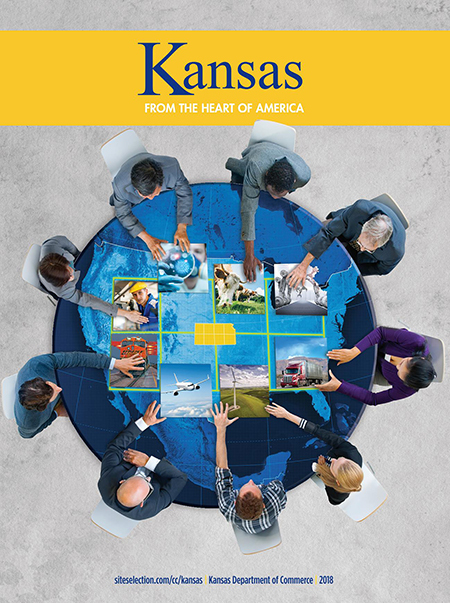 "After a multi-month site selection search in several states, including Kansas, Spirit chose Wichita to expand its operations," says Sam Sackett, Senior Manager, Government Relations & Corporate Communications, Spirit AeroSystems. "Several very aggressive incentive packages from more than six states were considered in making this decision." He says the company's growth is being driven by expanding production rates on commercial products as well as growing statements of work in defense and fabrication. President and CEO Tom Gentile intends to grow both Spirit's defense work and fabrication operation to $1-billion-per-year businesses. In May, Spirit broke ground on its state-of-the-art Global Digital Logistics Center that will increase storage capacity and part retrieval efficiency at its Wichita site. The new 150,000-square-foot facility is being funded through a collaboration agreement between Spirit, the City of Wichita and Sedgwick County. When complete, the 70-foot-tall building will serve as a smart distribution center to better manage the rapid storage and retrieval of parts used in the assembly of large aerostructures. "The Global Digital Logistics Center supports our strategy to improve production flow time by more accurately managing inventory and ensuring the right parts are at the right place at the right time," said Tom Gentile at the groundbreaking. "As we increase production rates and expand our operations in defense and fabrication, we will improve and expand our capacity to rapidly build complex aerostructures for high-rate production programs at a competitive cost." Spirit will establish a presence on the Innovation Campus that will further its collaboration with WSU researchers and engineers. Spirit will leverage R&D opportunities with the National Institute for Aviation Research. Spirit will expand its workforce training and collaboration with the National Center for Aviation Training and provide more applied learning opportunities to WSU students. "This type of university/industry collaboration is exactly the kind needed to strengthen the regional economy and prepare students for careers in the aerospace and manufacturing industries," said Wichita State President John Bardo. "It's also a prime example of university research labs working in concert with the workforce training capabilities of WSU Tech. Spirit's commitment to accelerating its R&D initiatives by partnering with the university will provide long-lasting benefits for the company, the community and generations of students." This is just one measure Spirit AeroSystems is taking to address its staffing challenges today and in the future. Spirit may be the biggest player in southeast Kansas's aviation cluster, but it's not the only one. Demand for aerospace workers is strong, and unemployment rates nationally and in Kansas are low. "While this is good for those seeking jobs, it creates challenges for advanced manufacturers who are struggling to find candidates with the right skillsets needed in a highly technical manufacturing environment, says Sam Sackett. "Today's aerospace technology requires that employees receive specialized training to ensure a high level of quality for our customers." In addition to the WSU collaboration agreement, he says, "we are leveraging partnerships with multiple technical and vocational institutions to develop industry-specific training programs around Spirit's core competencies. This includes training in sheet metal assembly, fabrication and machining and composites. We have received strong support from the [Kansas Gov. Jeff] Colyer administration and the state legislature supporting initiatives that encourage more high school students to earn technical training certifications before they graduate. This helps increase the pool of qualified applicants for aerospace jobs. The state has also worked with our industry to strengthen aerospace technical training programs for those looking to change careers." City and county leaders have also stepped up their efforts to partner with Spirit on projects that make the company more competitive, notes Sackett. Examples include infrastructure for direct access to high volumes of recycled water for industrial use to assistance building the Global Digital Logistics Center. "In every instance," he says, "the City of Wichita and Sedgwick County have shown their willingness to be creative in working with us to help make our expansion successful." Another initiative aimed at creating a strong pipeline of talent is Spirit's intern and apprenticeship programs for skilled trades. In addition to college student interns, last year Spirit launched a high school intern program. "Based on its success, we doubled our high school interns in 2018," notes Sackett, illustrating Spirit's approach to broadening employee recruitment. "We used to focus solely on the local markets for manufacturing positions, and we are now expanding to be regional, and in some cases, national," he relates. "Whenever possible, we try to work with community leaders and educators to reinvigorate interest in manufacturing careers. Each of these paths combined with our enhanced in-house training will be important to create the talent pipeline necessary to meet the growth in the market." Businesses that plant their roots in America's Heartland reap the benefits year over year.